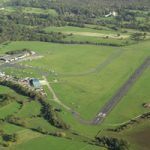 Fairoaks 2020, the volunteer campaign group fighting plans to close Fairoaks Airport to create 1,000 homes on its Green Belt site, has been swift to galvanise support from the 177-member-strong All Party Parliamentary Group (APPG) of MPs and Lords for General Aviation. The APPG, led by Grant Shapps, has just added its support against the planning application, formally filed by the Fairoaks Garden Village (FGVL), the current airport owners, in October. “We do not believe that such a large development and potential loss of 400 acres of Green Belt landscape – that could result in the closure of this strategically placed airfield to the south west of London – should be made by a local planning committee,” challenged Fairoaks 2020 Chairman Douglas Mancini. York Aviation’s initial report stated that Fairoaks Airport is ‘not viable,’ but Fairoaks 2020 strongly challenges that. It is based on itscurrent (dual) ownership structure, which could be changed, Mancini asserts. Furthermore, its recommendation that operators move to other nearby airports is flawed, he adds. “The YA Report suggests demand could be met from other London airports, but this is incorrect. There is now only one airport in the London area, London Southend, available for use overnight, without any restrictions. In neighbouring Hampshire, Farnborough Airport (serving primarily VIP jets) is not interested in general aviation. Its fees do not suit the general aviation sector either. Redhill is under threat. Blackbushe Airport may not get the permission it seeks for its expansion. Denham Aerodrome, which YA recommends could also take up Fairoaks’ movements, is busy with fixed wing and helicopter GA activity,” he adds. In order to sustain the anticipated 4% growth in air traffic per annum, it is widely forecast the international aviation industry will require over 600,000 new pilots by 2035. Over 100,000 of them are needed in Europe, according to Farnborough-based recruitment firm AeroProfessional. “Aside from the obvious pilot shortage issue, there is a further risk of airlines targeting much needed instructors to fulfil short term needs, rather than investing in long term training. It is therefore vitally important we fuel the talent pipeline from the early years and invest in the education of young aviation professionals and resources needed to ensure a successful outcome. Aerodromes that give the next generation access to general aviation are thus a critical part of this process,” AeroProfessional Director Sam Sprules concurs. The Organ Transplant work is critical in saving lives across the UK, since organs have to be harvested from donors within a short time frame and flown on to where the recipients are based. The transplant teams who harvest and implant the organs, the donors and recipients, are based in different parts of the UK yet they all have huge dependence on access to local airfields. One King Air 200 based at Fairoaks has a high utilisation rate of organ transplant work, which is time critical, regularly requiring operations into the night and early morning. The twin turboprop can fly in and out of Fairoaks in all weather conditions. This is why this aircraft owner is backing Fairoaks 2020. “Fairoaks Airport is a critical link in the organ transplant chain. To lose it, with its close proximity to London and the M25 motorway, would mean that organ transplant activities could be impaired, especially considering few other airfields have such capacity and flexibility. 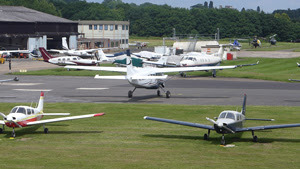 Fairoaks is the only airport which offers a hard runway, is available overnight and at weekends. Organ transplants have saved many lives in the recent past, and this would be put at risk by losing Fairoaks. Should Fairoaks be closed for housing the UK would lose a critical component in the GA network, which can never be replaced again. The only beneficiary from the proposed development would be the developer, who would not pay any of the consequential impact costs, which is at the expense of the existing local community and the GA fraternity at large,” he asserts. In its objection, Fairoaks 2020 challenges that no ‘Very Special Circumstances’ to build on Green Belt land have been demonstrated. Rather, the building of 1,000 homes on an open greenfield site will seriously harm the landscape and biodiversity. Central to residents’ concerns will be the anticipated traffic gridlock, an inevitable result of 2,000 plus more cars, adding to already congested roads. Plus the years of upheaval, pollution and inconvenience such building work would bring. (To date there has been no consultation with the Highways Agency regarding the impact the additional traffic would have on the neighbouring M25 and M3 motorways, the group note. At numerous public meetings and subsequent open days ahead of the plan being announced in November 2016, there has been zero support for this housing, says Douglas Mancini, only widening concern from local residents and uncertainty for leaseholders and aerodrome tenants. The proposal by the applicant fails to provide adequate and safe infrastructure or mitigate its significant transport impact, it states.